Love Your Heart This Valentine’s Day! Our hearts take center stage in February! Since we celebrate both Valentine’s Day and American Heart Month in February, it’s only fitting that we spend a little time thinking about one of the most important organs in our bodies. First, the bad news: heart disease is the leading cause of death in the United States. In fact, half a million Americans die from heart disease every year. The good news is that most of the risk factors for this pressing health issue—including high cholesterol, high blood pressure, smoking, poor nutrition, and sedentary lifestyle—are preventable and reversible! A great Valentine’s Day gift is to show your body and your heart some love and appreciation by taking the steps that are necessary to live a longer, healthier life. With just one small sample of your blood, the InsideTracker program can show you how your heart-related biomarkers can improve with nutrition and physical activity interventions. While high cholesterol is one of the major modifiable risk factors for coronary heart disease and heart attack, keep in mind that cholesterol itself isn’t bad. Cholesterol is a waxy substance that is found in all the cells of the body. You need some cholesterol to make hormones such as testosterone, vitamin D, and substances that help you digest foods. Your body makes all the cholesterol it needs, and it is also is found in some of the foods you eat. Cholesterol travels through your bloodstream in small units called lipoproteins, which are made out of both fat and protein. There are two different types of lipoproteins that carry cholesterol throughout your body: low-density lipoproteins (LDL) and high-density lipoproteins (HDL). High levels of LDL can result in a build-up of cholesterol in your arteries, which are the blood vessels that carry blood from your heart to your body. Eventually, LDL cholesterol can enter your blood vessel walls and begin to accumulate under the lining of your vessels, restricting blood flow. In contrast, HDLs act as cholesterol scavengers, carrying cholesterol from other parts of your body back to your liver, where it is processed and removed. Total cholesterol, LDL, and HDL are three of the many biomarkers that InsideTracker monitors, so if your levels are unhealthy, the program will provide you with tailored recommendations on how to optimize them based on the new guidelines from the American Heart Association. Click here to learn how InsideTracker can help you optimize your biomarkers and keep your heart healthy with personalized diet recommendations! How does stress affect your heart health? While a little stress can be beneficial because it can act as an incentive to accomplish certain goals, constant stress can become a health issue. When you are chronically stressed, your body responds like it is constantly under attack. The long-term activation of your stress-response system can put you at an increased risk of health problems, including heart disease. Cortisol is commonly referred to as “the stress hormone.” Elevated cortisol levels can often indicate high levels of stress. When the body faces a stressor (such as trauma, emotional exhaustion, or severe calorie restriction), cortisol is synthesized from cholesterol and released by the hypothalamus, which is a part of the brain. Cortisol then diverts energy away from low-priority activity, such as the immune system, and spares available glucose for the brain, putting all energy towards the more immediate threat. In the past, this stress mechanism served us well. After a stressful event occurs, however, it is important for the body’s function to return to normal, and for the relaxation response to be reactivated. In today’s world, while many stressors certainly exist, there are fewer threats requiring such immediate attention, and our bodies often remain in elevated levels of stress for extended periods of time. When we are chronically stressed, the body continuously releases cortisol, which may result in heart problems. What are some steps you can take to protect your heart? One of the most important steps you can take to improve your heart health is to know what’s happening in your body. The best way to determine your cholesterol and cortisol levels is to get a blood test done. What you eat also can have a huge impact on your heart, and you can decrease your risk of heart disease by avoiding foods that are high in unhealthy fat, calories, sugar, and salt. Some foods, on the other hand, help to decrease stress. To lower your cholesterol, you can replace unhealthy fats with healthy fats and replace refined carbohydrates with whole grains. 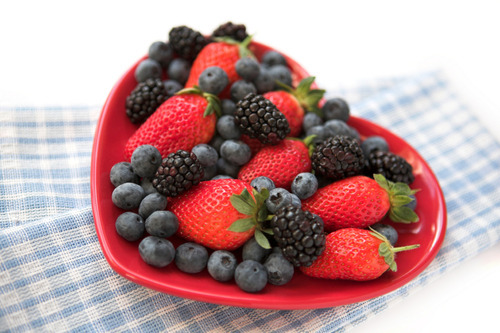 Keeping Valentine’s Day in mind, you can treat your loved one to a heart-healthy meal that includes plenty of fruits, vegetables, and lean protein or spend some time together dipping fruit in chocolate instead of just buying a box of regular chocolates! Most importantly, if your heart-related biomarkers are not optimal, make sure you work to monitor your progress. Eating nutritious foods, along with getting regular exercise, can go a long way in helping you to keep your heart healthy and happy this Valentine’s Day season!